Trunks: Erect; bark grayish brown to reddish brown, fissures shallow, plates more or less rectangular, thin; wood light brown, hard. Twigs: Reddish gray to purplish green, flexible, smooth, appressed-hairy; leaf scars crescent-shaped; buds reddish brown, ovoid, .08 to .2 inch, apex obtuse, scales hairy. Leaves: Deciduous, opposite, simple; petiole .12 to .8 inch, pubescent; blade ovate to elliptic, 2 to 4.8 inches long, 1.2 to 2.8 inches wide, base wedge-shaped to rounded, margins entire, apex abruptly acuminate, lower surface pale green, glabrous or pubescent, upper surface dark green, glabrous or pubescent, lateral veins in 4-6 pairs, mostly arising from proximal half of blade. Flowers: Inflorescences terminal on current-year wood, cymose heads, 12-30-flowered, .4 to .8 inch diameter; subtending bracts 4, white, sometimes tinged pink, petal-like, usually unequal, obovate to round, .8 to 2 inches long, .8 to 1.6 inches wide, apex notched; peduncles .4 to 1inch; pedicels absent. Flowers bisexual, radially symmetric; hypanthium cylindric, .14 to .16 inch; sepals 4, connate proximally, calyx lobes green, triangular, .02 to .03 inch; petals 4, inserted on nectar disk margin, lobes greenish yellow to cream-colored, narrowly lanceolate, .12 to .16 inch, stamens 4, .16 to .18 inch; style 1, .1 to .12 inch. Fruit: September; drupes, reddish orange, ellipsoid, .35 to .6 inch × .24 to .3 inch, minutely pubescent; stone 1, tan, ellipsoid, symmetric, .28 to .43 inch × .17 to .28 inch, with 5-7 longitudinal grooves. Habitat: Sandy to gravelly soils in forests and woodlands, bluffs above streams. Uses: A number of Native American tribes used the bark to make infusions or decoctions to treat a variety of ailments. 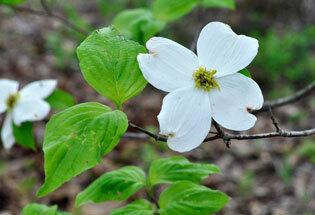 Comments: Found only in the southeast corner of Kansas, Cornus florida is one of our most showy native trees when in bloom. It is a frequent ornamental in eastern Kansas, and cultivars with pink or red bracts are popular.